Apple issued updates for iOS, OS X, WatchOS and tvOS about early August to patch a serious security hole that could allow hackers to steal login and password data. So, if you own an iPhone, iPad, Apple Watch, iPod touch, Apple TV, or a Mac, then it’s time to update your device to keep it safe from hackers. 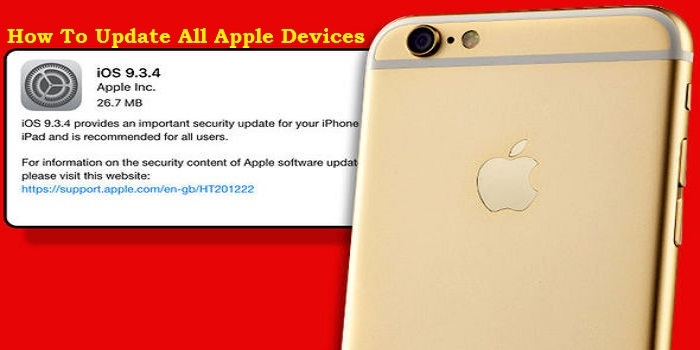 Apple “important security update” for iOS 9.3.4 for the iOS 9 operating system came just two weeks after releasing iOS 9.3.3 and less than two months before we expect to see the public release of iOS 10, currently in beta testing. iOS 9.3.4 is available immediately via an over-the-air download on all devices running iOS 9 and is likely to be the last update to iOS 9, with iOS 10 coming in September alongside new iOS devices. Updating all your Apple devices will get you more prepared. It is important to note that, iOS 9.3.4 fixes the Pangu’s Chinese iOS 9.2 to 9.3.3 jailbreak exploit or any other Pangu’s jailbreak technique. In a support document covering the security fix included in the update, Apple credits Team Pangu with discovering a vulnerability related to a memory corruption issue. Click on the Apple icon () in the top-left of the screen and choose App Store. From there click Updates in the menu bar to see all the updates you need to install. The latest OS X update is El Capitan 10.11.6. Click on Settings > General > Software Update to see if you have any updates waiting for you. The latest update is iOS 9.3.3, and this is compatible with iPhone 4s and newer, the 5th- and 6th-generation iPod touch, the iPad 2 and newer, as well as all iPad mini and iPad Pro devices. The process here is pretty much the same as with iOS. Go to Settings > System > Software Updates > Update Software (on earlier devices this is slightly different, and you have to go Settings > General > Update Software). From there, click on Update Software. The latest update is tvOS 9.2.2. You update the Apple Watch through the iPhone it’s connected to. Fire up the Apple Watch app and then tap General > Software Update. The latest version is watchOS 2.2.2. Many iOS users prefer to enjoy the customization a jailbroken iOS device offers hence the idea to update Apple devices is not an option. Otherwise, Apple’s iOS 9.3.4 update is recommended for all iOS 9 users. Meanwhile, Apple bounty program has been launched offering hackers, researchers and cryptographers up to $200,000 to find security loopholes in its products.